Containing 96% succulent chicken and goose, this delicious complete food for cats is delicately steamed in its packaging to lock in all its goodness. Also containing superfoods such as cranberry and spirulina, but totally grain and gluten free. This is the perfect complete meal for allergy sensitive cats. •	Grain and Gluten free! •	Suitable for adult cats aged 1-7 years. •	Steam cooked to lock in all its nutrients and goodness. •	Contains wholesome and flavourful super-foods. 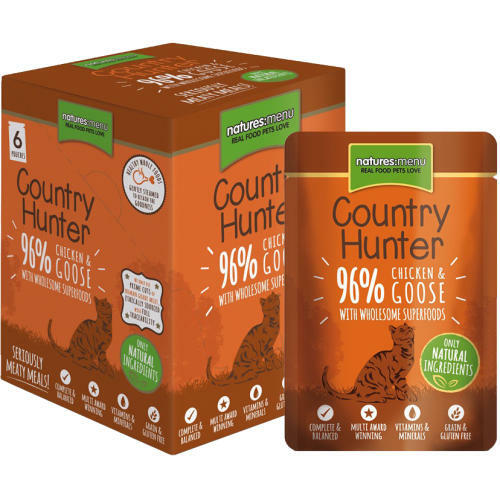 •	Nourish your cat naturally with Natures Menu Country Hunter Chicken & Goose Pouches! •	Great for allergy sensitive cats.